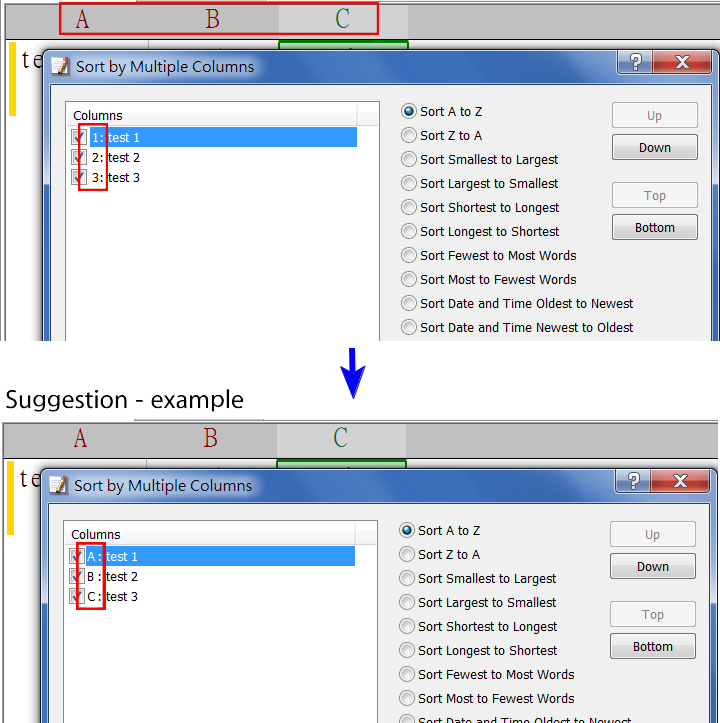 Suggest to add an additional option to “Uses Alphabetical Characters Columns Name” for the following dialog boxes for more consistent and clear. 2. Refer to fig.1, in Excel, if we want to edit the “test”, we just need to move the cursor to the position between the letter “t” and space ” “, and then double-click for edit. But in Emeditor, refer to fig.2, if double-click, the cursor will be moved to the end of cell strings. It will need another step to click again on the position between the letter “t” and space ” “. Therefore, suggest to add an option in CSV page, “Double-click to Direct Edit Cell at Cursor Position” check box, for more convenient and also consist with Excel. 3. Suggest “Sum.jsee” can be worked in the CSV mode. These issues were addressed on v17.2.0 beta 4.